September 2015 – Teach. Brian. Teach. 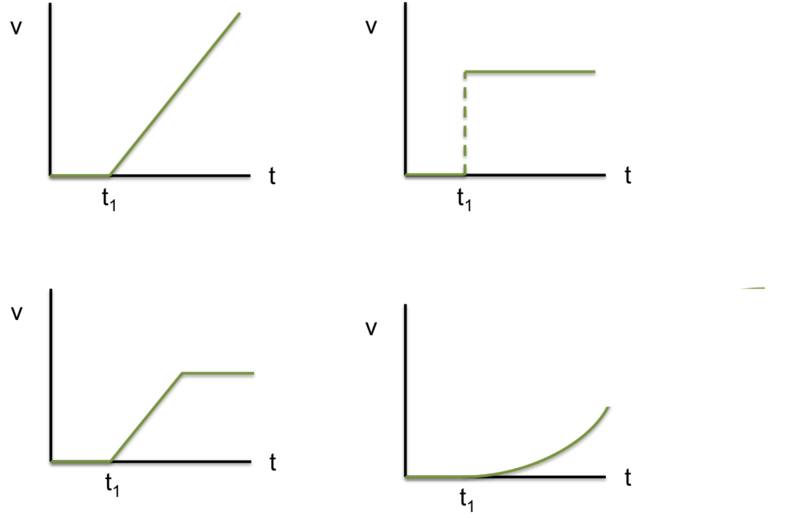 Here is a desmos file I made earlier today, where you can explore motion on frictionless ramps… nothing special. 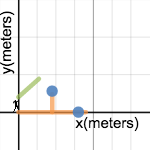 Desmos is working on a qualitative sketch feature, so that students can make qualitative sketches that also can overlaid. The cool part of this post is students’ arguments in part 3, but I wanted to share how we got there, and what we did with it. Overall a great day in Physics I. A force always occur because of agent (who exerts the force). I add to that definition that a force is something that happens (like a party), and that it could be happening for a while but later not be happening. We then did the Normal Force Bridging analogy from Preconceptions in Mechanics. We do demonstrations, vote, and discuss the following situations. 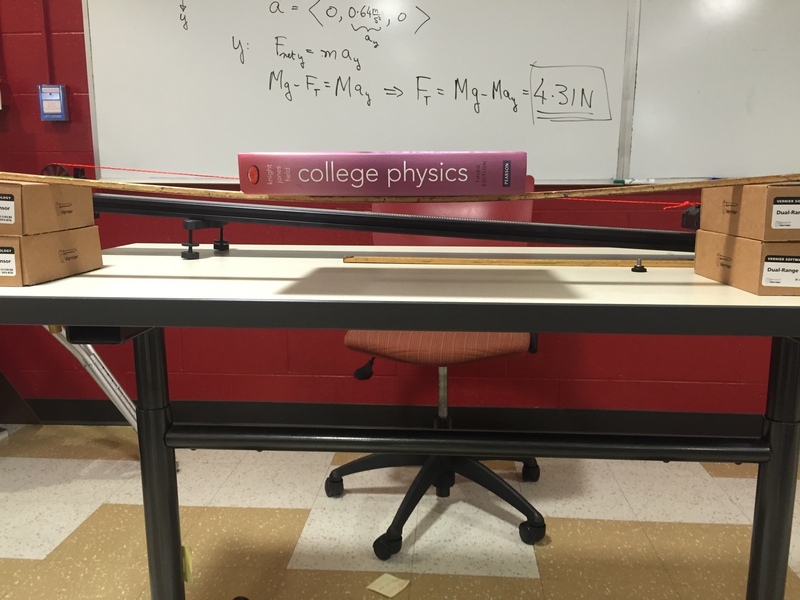 Is table exerting a force on the table? Is the spring exerting a force on my hand? 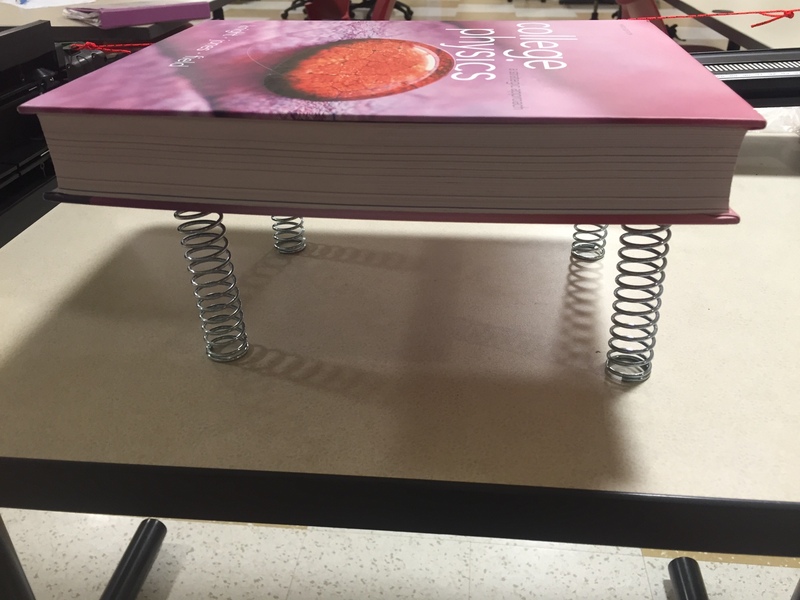 Is the spring exerting a force on the book? Is the foam exerting a force on the book? Is the table exerting a force on the table? The point is to keep the conversation focused on observable evidence of pushing (deformation, compression,). Then you do an experiment with a laser on a mirror that’s been placed on the table. And then you stand or sit on the table. That went pretty well. Knight’s books starts, not by drawing free body diagrams, but by drawing a picture, identifying the object of interest, drawing a boundary around the object, identifying an other objects that cross the boundary (exerting contact forces), and then identifying any long-range forces. I modeled how to draw a good picture and identify the forces for the setup above, and then students white-boarded 4 situations. 3. Pre-Lab Clicker Question: What does a force do? A. It has to either be the top-right or the bottom-left. The problems says the finger is pushing the same way, so that means it’s going to move with a constant speed. It might be that you’ll be able to see it speeding up, or it might happen so quickly it looks like a jump. B. It has to be either of the top two. It says the finger pushes the same way. I don’t see how it could be the bottom-left, because the finger is doing the same thing the whole time. How could the graph change what it’s doing if it’s finger doing the same. C. I don’t think it could be the top right, because the velocity can’t just jump up to a speed right away. When you are driving in your car, you can’t just go from 0 mph to 50mph immediately, the speedometer has to pass through all the speeds in between. D. The question says that finger is pressing with the same pressure, but I don’t necessarily think that means you push with the same speed. It doesn’t say you push with the same speed. I’m still trying to figure out what same pressure on your finger would do. Like, If you push something uphill, the same pressure might not be enough to push it up, or it might be just enough for it to keep a speed. But if you push something on a flat track, same pressure might be enough to keep it speeding up. E. I think it depends whether there is friction. Like if you are pushing something across a carpet, there’s a lurch. Like it’s not moving and then all of sudden it goes. With the cart’s in this class, there’s not much friction, so there’s not going to be a lurch. 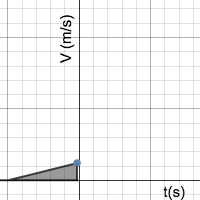 The only graphs that are smooth looking, are top-left and bottom-right. After t1, they do a smooth thing. Students had a good conversation, and I facilitated well—mostly using re-voicing to clarify and compare/contrast ideas. The usual suspects in class were contributing, of course, but a lot more people jumped in, which was good. Students were then asked to do some experiments to help us decide what forces do. They did their experiments with Fan Carts and Motion Detectors that mirrored our discussion. Other groups wanted to try longer tracks (to see if it would level out eventually)- I gave these groups hover pucks to play with out in the hallway. While circulating, we had lots of really good discussion and questions about what they were seeing, what it did or didn’t show evidence for, what would be different if there was friction, etc. The pre-lab clicker question did a really good job of setting up the lab exploration. Students knew what they were trying to do and had a sense of purpose– help us decide what a forces does. Students found a nice balance between pursuing the lab goals and playing around to see what happens. For example, one group kept trying to change the mass of the cart so that a buggy and the cart would get across the track at the same time. Another group tried to add just enough mass to the 2nd fan cart setting so that it would accelerate that the same as the 1st fan cart setting with now mass. They were heard cheering loudly when they made that happen. 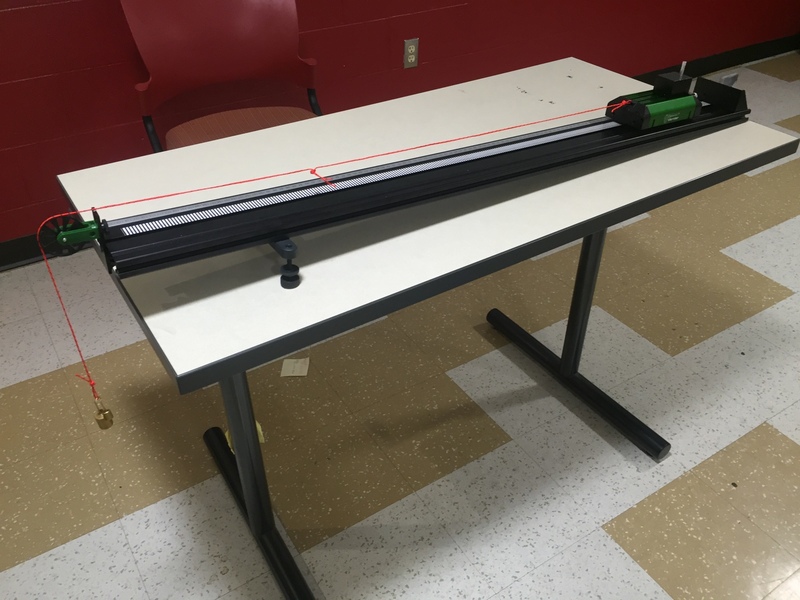 In our second challenge lab of the semester, students had to predict where a ball would land after rolling off a table, but also predict where to release a battery-powered buggy so that the ball hits the buggy as it drives by. The setup was that ball first rolled down a brief starter ramp and then went briefly on horizontal track before going off the table. They were not allowed to let the ball roll off the table before the experiment, but they could collect data about the motion of the ball along the horizontal track and motion of the buggy along the floor. 1/8 of the group used a single photogate setup, where challenge was to align the sensor with the center of the ball so you know the length of travel while in the gate. 2/8 of the groups used a two photogate setup, where the two photogates were set close to each other and students used distance between the gates. For buggy various groups used motion detector or stopwatches and meter sticks. Not working diligently enough to get a reliable starting condition to get consistent speed of the edge of the table. Not isolating carefully enough the instantaneous speed of the ball (but perhaps an average speed). The ball doesn’t slow much across the track, but enough. One group used a two photo gate setup, but actually used each photogate as a single setup, say that the speed dropped from about 62 cm/s to 58 cm/s. 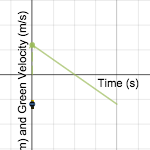 Another groups calculated slope of position vs. time across the first half/ second half and found 58 cm/s vs. 55 cm/s. 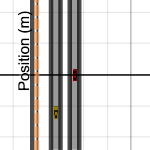 Not working diligent enough to get a good measurement for the time spent on ramp and track. Some groups were so diligent in other areas, but then rushed this part. Often it was the last thing students did, because it dawned on them later that this extra time mattered for knowing where to release the buggy from. All and all the day was pretty successful. Students were engaged, with many taking different approaches to collecting and analyzing data, identifying and working through different issues that arose for them. Students are getting the hang of being presented challenges, transforming the situation into a problem, and deciding they want to collect data and with what equipment. On Thursday, we switch to new groups and start our new unit on Forces. Principle 1: People tend to organize their experiences and observations into mental models. Students’ minds are not blank slates. Principle 2: It is reasonably easy to learn something that matches or simply extends an existing mental model. It is difficult to learn something you do not almost already know. Principle 3: It is very difficult to substantially change an established mental model. Principle 4: Individual students can have different mental models. There may be not one best way to teach all of them. Really watching the video is meant to review main points of reading, but with a shared context for talking about them. In general, I have more success providing a context for students to talk about a paper then I do just talking about the paper. I think I then want to link this video and the paper to our discussion last week about photosynthesis and respiration/metabolism: how we each had some mental models of about how we lose weight / how trees grow, which were in many ways different than the scientific model that emphasizes carbon exchange. I’m thinking we might spend some time gathering some our ideas that influenced our thinking weight loss / tree growth, and reflect on where different ideas came from, why they make sense, etc. There was the idea that roots digging into the ground get mass from the soil. Others thought the the mass could come from sunlight. Nathan added to that the idea that sun light powering the tree to use its roots like a pump… the sunlight powers the operation, but the mass comes from the soil. Sarah had the idea that as we work out, we lose energy in the form of heat–as the heat radiates away we loss some weight. Claire had the idea that we probably lose weight later (like in the bathroom), but others felt the weight you lose by going to bathroom isn’t from your fat… it’s merely the unusable food you ate. Or in the case of liquid, that weight comes and goes from hydration levels. I’d like to emphasize how my facilitation of the conversation was guided not just by talk moves, but by an ongoing attempt to make sense of what students’ mental models were, and how they compared to each other. I took time to ask Josh to explain his idea again to the class. I compared and contrasted two ideas I heard (e.g., Sarah and Jason both think it’s about your body taking in something and putting out something. Sarah thinks it’s food energy that gets radiated as heat energy. Jason thinks it’s carbon you take in (with foods) that gets breathed as carbon dioxide. The real activity for students is I want them to practice finding out about students’ mental models. I thought about watching another periscope video, but the website seems to not be working. What common mental model(s) did you hear in the video? Explain what those people were thinking and why their ideas made sense to them? What experiences or observations might they have made that contribute to their mental model? How are these mental models different than the scientific one? How might knowing about students’ mental models change the way a teacher approaches helping students learn the topic? I’d like to end the day, talking about what this has to do with being an LA. How can knowing about students’ thinking and ideas change the choices you make in helping them? Within the constraints of your classroom, how can you find out about students’ mental models? Still a bit of vagueness in this plan, but that’s where I’m at. (1) Students make a guess about an angle and velocity that will work to get a volley ball serve. 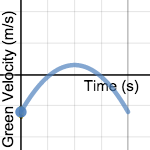 They get immediate visual feedback about their guess int he form of an initial velocity vector. (2) Students then work the problem they’ve chosen I’ve added some scaffolding to do this. I’m hoping to get this into the activity builder, so when they place their two points, all other students can see other group’s attempts (both successful and failed). (3) Right now, there’s a feature to check your answer–it shows the whole trajectory for the points you calculated. It’s easy to extend and explore further questions. A. The scaffolding might force students into doing a particular way with less thinking and deciding for themselves. B. Having the check your answer might lead students to just find a speed an angle without working it out. Every semester, I give the same 3 questions on a survey, always after 1st test, before they get it back. What do we do in class that is helpful for your learning? Why specifically is it helpful? Working problems in class is helpful. Seeing you do problems is helpful, then working similar problems. It’s also good to see and hear what other people think is correct and having to defend those answers. The conceptual discussion along with the clicker questions are helpful with gaining a theoretical understanding. The example problems that we work as a class are also helpful. I really benefit from the clicker questions and whiteboard work. It’s helpful to discuss to get a feel for the different ways to look at a problem and why an answer works. Whiteboarding helps me because get to practice while having opportunity to asks classmates and/or teacher questions. Whiteboarding problems are more helpful. We actually apply what we learn versus solely being lecture to. I think it helps because it assists you in getting familiar with the problems and knowing the purpose of them. That we solve problems as a class but also ones with our group. Also clicker questions also help a lot. Problems we do in class, helps me understand how to apply concepts. Clicker questions help as well, gets in more practice, and you go over them which helps. I enjoy how you give us chances to get things right like going over how to setup a good pictorial representation. Clicker questions are helpful. Working problems is helpful. Builds a good foundation on the concepts. Working in groups has been beneficial, because it allows for more one on one help from peers. I am more lecture-oriented. Therefore, I find lectures and class discussion very helpful, but I do enjoy working in groups and find it helpful most of the time. The mathematics portion of the class is helpful. I like the labs and the problem solving on whiteboards. Using the whiteboards allows us to see our mistakes while we’re learning. Clicker questions and discussing answers within our groups and the whole class. Working on problems on the whiteboard. Learning from other people, not just from the instructor. Reasoning. Explaining in different concepts the concepts that we are testing with the clicker questions. Thinking about we can arrive at answer in different ways ensures that I’m not just memorizing answers. Clicker questions, because we can think about it together and then discuss it with final feedback from the instructor. Group problem-solving. This helps eliminate errors in steps and helps us remember not to forget certain steps. Everything is helpful. I think what helps the most is clicker questions. I like the fact that we go over how get the answer and that you ask us about our thinking process. Group work, clicker questions, and whiteboarding is all helpful. The best to learn physics is to practice and that’s what we do. It helps a lot because I need a visual aid. I like how involved everything is and making everything group really lets us exercise our strengths. Clicker questions-I find this helpful going over in class what the correct is vs the wrong answer. Group work is helpful and we are able to talk to each other and strategize. Group work while you walk around to check on / help groups. This helps because I have other people that can correct me and point me in the right direction, and when I help other’s in my group I end up knowing the subject matter better myself. Clicker questions and group explanations helps me understand the material. 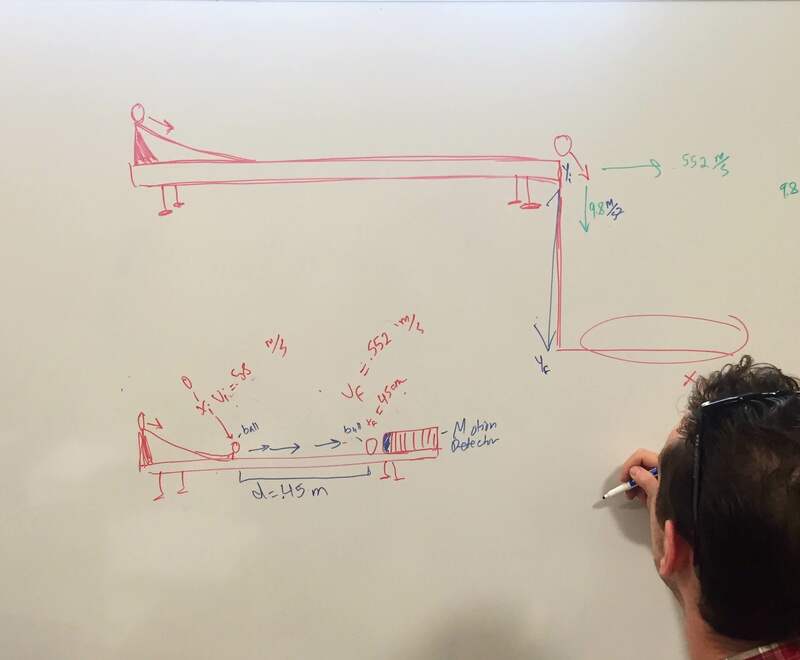 When we do whiteboards, if watch someone who knows what they are doing, it helps me understand instead of not knowing what do, and then I can try to attack the next problem with the marker. The labs. They give me a tangible sense of problems and enhance my view of the problems. Working the math formulas out in a group. It’s helpful because you can see how other do it plus ask questions. Practice problems are very helpful, because we continue to set up and solve problems, so I know how to do it for the test. The overall style is helpful for learning– going from concepts, to seeing if everyone understands those concepts, to quizzing those concepts, to applying those concepts. It flows well and sets you up for success. I love clicker questions. The positive feedback gives an immediate chance to correct misunderstandings. I like group work and multiple practice problems. We get multiple interpretations and strategies to solve problems. Clicker questions are helpful. Mostly when we discuss our answers as a group and as a class. Problem solving helps and working as a group helps me compare my ideas with classmates and makes me work my best. I like the hands on stuff with labs. I have a hard time with the reading and comprehending so, when I see it visually or do it, it really sticks. So for I have not run into anything unhelpful. I don’t like working in groups, but it definitely helps me learn so I need to get over it. I think mastering physics is a useful tool in some cases, but not all. I do not like relying on the computer program for homework and reading quizzes. I often feel like I’m working on my own and pulling teeth to have the group work done together. I leaves me feeling overwhelmed and responsible for others’ learning. Too much group work can be unhelpful, because it can give me a false sense of confidence. Labs are not helpful. I would rather do more clicker questions or problems then do lab. Lab confuses me. Too much down time between activities. The length of this class i hard. Maybe a 5-10 break? May help us stay focused. Group work is helpful, but if we are going to do so much of it, then she should do group quizzes/ tests. Also lab does not really pertain to help with what we are learning in the book. I wish we could stay with the same groups. Why fix what’s not broken. Not enough mathematics with explanation. The groups are not balanced. I think it’s unfair for some groups. Occasionally, group work can be unhelpful. So far, everything is working out well. There is nothing specific that is unhelpful. I do think groups are not evenly balanced, knowledge-wise, and that can lead to frustration. The labs aren’t unhelpful, but I do not feel like I’ve retained knowledge from them. Can’t think of anything bad. I would like if it were more clear what pages to read for each reading quiz. I dislike the labs-Although it may be helpful, I found myself stuck when it came to relating it to the rest of class. I feel like we need more than an hour for tests. Slow workers need more time. Whiteboard exercises we do as groups are unhelpful because it seems we could use more examples as a class in order to be ready to break into groups. Group work is good, but I feel like I need to understand material before I can jump in with my group. Is there anything else that’s been on your mind? Something you want to tell me? Something we don’t do in class that you wish we did? My understanding on HW consistently lags one class behind. I never seem to understand the HW until the class after it’s due. as it stands I’ve come to accept losing points on HW in order to cut down the time it takes to finish. Maybe we could move each assignment back a class/ day which could help. It’s been a good class so far. HW is a little frustrating at times. I like the format of mymathlabs better than mastering physics. Mastering physics is a struggle. Online HW can be very picky. The extra learning that we can do is hard, because I feel like it picks bad problems. It sometimes picks problems we haven’t even read yet. Having HW due the day of the test was frustrating. I hate Pearson! The program is not consistent. Adaptive follow ups are ridiculous. Some of it is just too complicated. Can re review commonly missed online problems? Too many online assignments, and the site doesn’t work fully on an ipad. Hunger gets intense during this three hour class over lunch. I feel a test review would be helpful. I think we could do labs more together as a class than in our labs groups. Just more math when explaining. Learning thing without math is more challenging and leaves me with a weaker understanding of the material. I don’t like the adaptive HW… it gives you problems that are 4x harder than the original ones you missed. I think it would make sense to give you easier problems first, and then give you harder ones. Online HW is stressful. I wish personally I had more free time to come to tutoring or office hours, but I don’t. This class is awesome though, your really care, which I appreciate. I feel a review before the test would be very beneficial. I felt like I didn’t know what to study. We should lecture more and do lab less. Or more practice problems on our own so it’s more like a test scenario. You are one of the best professors I’ve ever had. I appreciate it. The adaptive follow ups do not get tested out unless you get 100%. Maybe 90% would make more sense? I wish you posted the powerpoints to study from. I wish we had more time for tests. I like group work, but I wish we did some, where we work alone and then check with our group. I HATE online homework. The computer takes off points, but can help you understand or explain what you did wrong. Mastering Physics makes me want to throw a fit. Knowing if the answer is right or wrong is good, but mastering physics can’t me WHY I’m wrong. Also, since I commute, your office hours are not convenient. Maybe you could go over some of the problems from our HW. The HW gets really frustrating,.. a bit is when don’t cover everything in class, so we have to learn some on our own. Teaching myself does not work well.